Fantasy Mosaics 3 is rated 4.2 out of 5 by 16. Rated 5 out of 5 by spiritlaughing from More Fantasy Fun As usual, starts off fairly easy and gets more difficult. In this edition you can choose advance or casual mode which is not available in the Fantasy Mosaic, or Fantasy Mosaic 2. 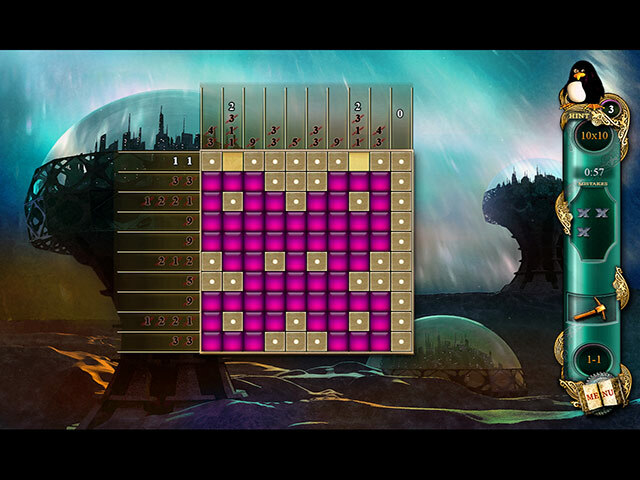 In casual mode, the numbers are marked off as you fill the corresponding blocks of the grid. In advance, it does not cross them off until the entire line is done. Again, the colors are very vibrant, cute little storyline if that matters to you, and as usual there are 20 sets of 5 puzzles, so you have 100 to solve. A great way to spend some free time, and exercise those brain cells. Rated 5 out of 5 by canadiangirl94 from Once you start you can't stop Recently bought the other two and now I'm completely hooked. Look forward to playing the next one. Rated 5 out of 5 by deepplum from I think these games are awesome! I enjoyed this so much I had to buy it. So glad a sale was on hahaha. I already have the other 2. Rated 5 out of 5 by TucsonGal72 from Love these I especially like the autofill when a line is complete. Saves time and adds to enjoyment. I wish there were more mosaics, griddlers,and other games of this type. Rated 5 out of 5 by jil1 from Fantastic! Like Fantasy Mosaic 1 and 2 this one is awsome!!! Loved and I´m already waiting for Fantasy Mosaics 4... 5... 50... 500... Really brilliant. Rated 5 out of 5 by ecblisa from The best mosai game so far I love this type of game, but am often disappointed that the more advanced levels require guessing -- that is, they are not solvable by logic. So far (five sets of levels into the game), this game is an honest logic game, not a guessing game. Mistakes I've made because the game gets quite difficult have been my own, either due to miscounting or due to accidentally using the wrong tool. I highly recommend this one to all addicts of the genre. Rated 5 out of 5 by pennmom36 from Keep Em Coming! I was a bit disappointed with the second Fantasy Mosaics because for some reason the games seems really difficult right from the get go. This Fantasy Mosaics, the third edition has totally redeemed itself in my eyes, the colors are beautiful, the games have just the right amount of challenge and I can't wait for number four! There are two modes of difficulty, casual where the numbers are crossed off one by one and advanced where the numbers are crossed off only when a row is complete. There are 20 different rooms and each room has 5 levels of interesting pictures when complete such as a gardener watering plants or a butterfly. Every step you take in the game helps to cultivate and restore a beautiful garden that transforms from an empty landscape to a beautiful zen garden, no real purpose, just for your viewing pleasure. There are gold, silver and bronze trophies awarded, depending on the time it takes you to finish the puzzle. Some of the squares have bonus power ups and when they are filled can be used to help you when you get stuck. There is a pickaxe that can be used on any empty square to reveal it's state, a powder keg which gives you one more chance to make a mistake, and a cute little penguin that represents the hint icon and will randomly highlight a filled square. As with the other mosaic games you use the left click button on your mouse to mark a filled square and the right button to mark an empty square, by using the number clues given both vertically and horizontally, every filled square is separated by and empty space or square. If the numbers given are 1 1 2 1 you would click a square to fill it followed by an empty square followed by another single square, empty space two filled squares, empty space and a filled square. It can be difficult when there are more squares than numbers but that's why it's so much fun, enjoy! Rated 5 out of 5 by dachsy from 3rd Fantasy Mosaics is Another Winner! 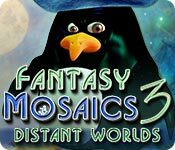 It seems only a couple of weeks or so ago that I reviewed Fantasy mosaics 2, and here we are with another instalment in the series. Entitled 'Distant Worlds', this one follows along similar lines to the previous two. In this one you have to restore a fantasy garden after it was destroyed by a terrible wizard. There are 20 venues, each having 5 boards. Two game modes: Casual and Advanced. In Casual mode, the number clues at left and on top of grid are crossed off one by one #as is normal#. In Advanced mode, however, the number clues are crossed off only when the row is complete, and that does indeed make solving more difficult. As with the first two Fantasy Mosaics, graphics, colour, and sound effects are both great. The ambient music in this game however, is different, being of a sombre, but haunting nature. As such, it is ok, but I found I had to have it at a low level to be comfortable. Gameplay is similar to the previous two in most respects. 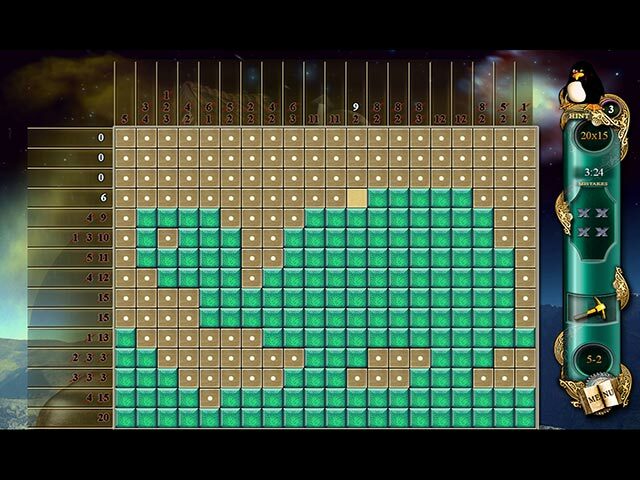 Like Fantasy Mosaics 2, it's straight into the action, with virtually no tutorial, and a 20 x 15 grid by the third board. You are allowed a predetermined number of hints and mistakes with each grid. However, with 'clever' play, both of these can be increased. As before, there is auto fill of 'x' cells after all 'fill' cells are completed. One aspect you have to be careful about #unlike most games in this genre#, is when holding down the mouse button to fill in a number of consecutive cells, you must not deviate off the 'line', otherwise they will not actually be filled. You play to achieve one of three trophies - bronze, silver or gold, depending on time taken. At the end of each venue #5 boards#, you are awarded an adornment to help restore the Fantasy Garden. So, this is another fine game in the series, which can take its place up there with the previous two, and which I recommend highly. Rated 5 out of 5 by highwayguy from Big Surprise! Okay. I'm a picross ADDICT, and have to try every one. I was not particularly excited by FM 1 & 2, but thought I'd try this. I figured it would be something to tide me over until the next World Mosaics, or, hopefully, Gemsweeper 2. (If only!) So I was rather blown away when, by level 5, we had a 15x20 grid! These puzzles are not hair-pullingly difficult (so far), but they do present a decent challenge, and you have to pay attention, especially on advanced mode. (I didn't try casual, but evidently it crosses off closed squares as they close, rather than when a row is complete.) The graphics are sharp and clear, the backgrounds nice enough, and the music rather zen-like. I have not come across any ambiguities, which is a pet peeve of mine when doing some brands of picross puzzles. Now, I won't get into the absurdity of having a penguin wanting his rather tropical garden restored - it's a fairy tale, right? But it did make me LOL. I suppose they feel they must make a storyline, no matter how silly, but if it isn't something interesting, like World Mosaics, then just give the puzzles! We don't care that much for the story on this type of game. At least I don't. 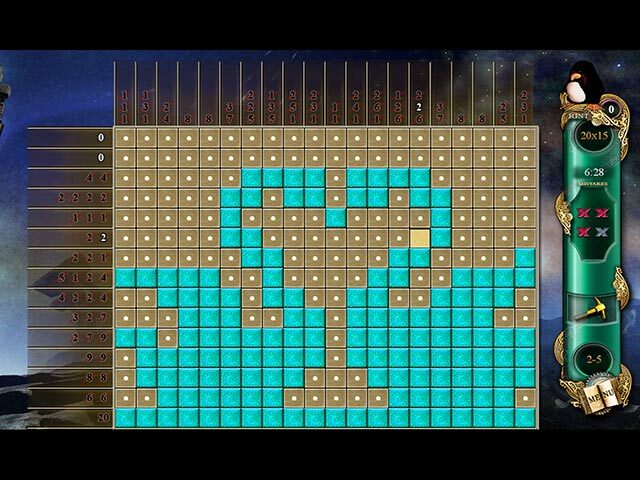 If you are a picross fan, you should definitely try this. I'll be buying it for sure! Rated 4 out of 5 by verimeri from could be better I am not done with the game but I am on level 11. Many of the puzzles are too easy-more like just filling it in than actually having to figure it out. Good game for beginning mosaic puzzlers.